The latest movie offering from OctoArts International is a timely movie for the worldwide celebration of Mother's Day. 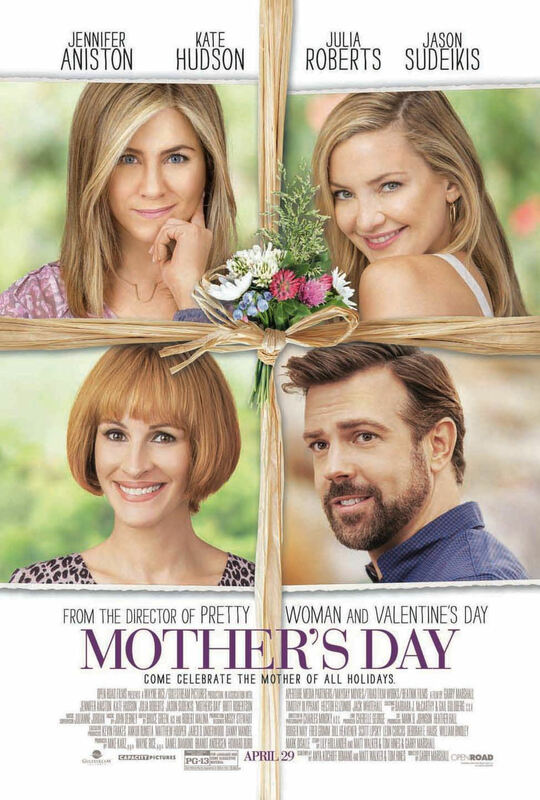 The movie "Mother's Day" is from the same filmmakers who brought to us movies with celebration day title and genres such as "Valentine's Day" and "New Year's Eve" ("Independence Day" not included). "Mother's Day" is a film, which revolves around four moms namely Miranda (Julia Roberts), the queen of a ubiquitous home shopping network and a secret mother, Sandy (Jennifer Aniston), the divorced interior designer mom with two sons, Jesse (Kate Hudson), the estranged daughter to her mom who married an Indian man, and "Mister Mom" Bradley (Jason Sudeikis), the widowed father to her two daughters who owns a fitness gym. Their lives intertwined in one way or another, but pretty much sure they have their own problems and situations while waiting for the celebration of "Mother's Day". The movie "Mother's Day" is fun and entertaining to watch. It's does not lack in story, not even short with the needed information. It is a feel-good movie made not just for moms, but for all people who love their moms as well. I think anyone with a heart for movies with mommies in it will surely melt your heart out while watching the film. The movie tells us that mommies come in different packages. Some mommies may have their shortcomings as a person or as a mommy as well, but they will surely find a way to make it up and fill up the gap for their shortcomings.In the end, a mommy will always be a mommy no matter what happens. Overall, we had fun watching "Mother's Day" so we are giving it an 8 out of 10 stars for story, actors and actresses, and entertainment value. "Mother's Day" is still showing in movie theaters, nationwide, brought to us by OctoArts International. Treat your mom and watch this film! Below is the official movie trailer for "Mother's Day"! Enjoy!